Bitterness in Citrus juices, other than Grapefruit, is perceived as having a negative influence on taste. The flavonoid Naringin that occurs predominantly in Grapefruit and provides the expected bitter note. The limonoid Limonin that exists in a tasteless pre-cursor form in all citrus and develops during or after processing. The bitter taste is largely unpleasant and is sometimes described as ‘dirty’ or ‘earthy’ with a lingering aftertaste. Citrus Oil, which if present in excess amount produces a harsh, bitter like taste sensation. 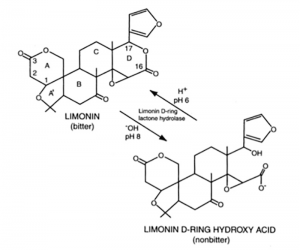 This article describes the occurrence, properties and control of Limonin. 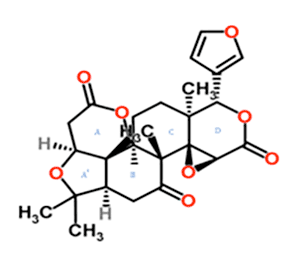 Limonin is a triterpenoid dilactone formed from its tasteless precursor Limonin hydroxyacid lactone located in the fruit tissue. The conversion occurs by contact with acid, for example when the fruit is disrupted as in juicing and is accelerated by heat, as during pasteurisation. 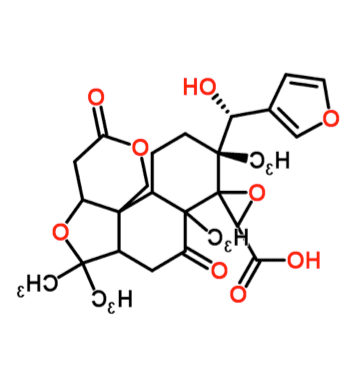 The tasteless lactone has an open ’D’ ring which closes under the influence of acid and heat to form the intensely bitter closed ’D’ ring lactone Limonin. (See diagram). The presence of the enzyme citrus limonoate D-ring lactone hydrolysate is also involved in the reaction. Limonin as such occurs in high amounts in citrus seeds. The highest levels of Limonin occur in Navel (and Shamouti) Oranges and when consumed fresh they are good to eat without bitterness. However, juice extracted from the fruit becomes bitter (with keeping/on storage) giving the rise to the expression/description of “delayed bitterness.” Because of the unpleasant bitterness, Navel Oranges are normally not processed to produce juice, but consumed as fresh fruit. Limonin levels in fruit tend to reduce throughout the growing season as the fruit reaches full maturity and additionally can decline during post-harvest storage; in Navel oranges with high Limonin content, such reduction has little effect on the flavour quality of the juice. The taste threshold of Limonin for the most sensitive is 0.5ppm, but for the general population the threshold is in the range 2 – 6ppm. At 8 – 12ppm juices become objectionably bitter. Navel Oranges yield juice with Limonin in the range 10 – 30ppm, while Sweet Oranges generally produce juice of 0 – 6ppm Limonin. To avoid unwanted bitterness in juices, Limonin content can be included in the specification with a maximum of 6 or 7ppm being typical. Control of Limonin throughout processing is possible by using mature fruit, avoidance of bruised or frost damaged fruit and extracting the juice under ‘soft squeeze’ conditions. Higher yields of juice are achievable with ‘hard squeeze’ methods, but the greater intermixing of peel and rag introduces more Limonin as well as and risking undesirable levels of oil and increased pectin levels. In the case of Grapefruit juice, there is an additive effect on bitterness from Limonin and Naringin. So while Naringin is a desirable component in grapefruit juice, the same controls for minimising Limonin content need to be applied during processing. 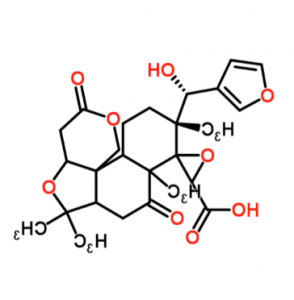 Recognising that Limonin bitterness is largely undesirable, maximum limits have also been applied to comminutes which have very high levels, as expected from the methods of manufacture. Comminutes are typically consumed at 2% of single strength in a beverage, leading to Limonin limits of 20 – 30 ppm at single strength to give 4 – 6 ppm in the drink as consumed. Limonin and Limonoids. Chemistry, Biochemistry and Juice Bitterness. V. P. Maier, S. Hasegawa, R. D. Bennett and L. C. Echols. Citrus Nutrition and Quality. 1980, 63 – 81. Morphology and Physiology of Citrus Fruit. S. V. Ting and R. J. Rouseff. Citrus Fruits and their Products, Analysis and Technology. 1980. 3 – 5. P. J. Fellers and E. C. Hill. Proc. Fla. Hort. Soc. 1986, 99:87 – 90. Internal Cadbury Schweppes Memorandum. R. G. Mears. 1986. Juice Chemical Reactions, Product Stability and Packaging.